INDIANAPOLIS, Ind. - Children and adults across the country discovered today that stamp collecting is "hobby forming" when the U.S. Postal Service celebrated National Stamp Collecting Month by issuing new commemorative stamps crawling with life-like depictions of insects and spiders. The first day ceremony for the Insects and Spiders took place at The Children's Museum of Indianapolis and officially kicks off National Stamp Collecting Month. 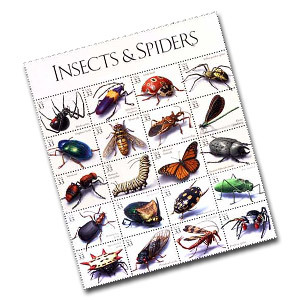 "The Insects and Spiders stamps are an excellent example of how stamp collecting helps spark the imagination of young children and can lead to a life-long educational experience," said Deborah K. Willhite, the Postal Service's Senior Vice President, Government Relations. "The Postal Service values its role as a community leader, and we believe the U.S. commemorative stamp program gives us an opportunity to connect with our customers in a very personal and entertaining way," she said. Joining Willhite at the stamp ceremony was Michael S. Lamborne, Postmaster of Indianapolis, Dr. Jeffrey Patchen, President and CEO of The Children's Museum of Indianapolis and Christian Oseto, Department Chairman of Entomology at Purdue University and President of the Entomological Society of America. Hundreds of local school children were on hand for the day's events and following the ceremony they participated in youth activities intended to open up the wonderful world of stamp collecting and to help educate them about the insect and spiders depicted on the stamps. Designed by Carl Herrman of Laguna Niguel, Calif., and illustrated by Steven Buchanan of Winsted, Conn., the sheet of 20 stamps features 16 insects and four spiders. The stamps represent a range of colors, lifestyles and behaviors of various insects and spiders and were chosen because of their educational value and interest to children. On the back of each stamp is text describing the features of the insect or spider depicted on the front. Text is provided describing insects and spiders in terms of their numbers, their staggering diversity and the benefits they provide the planet. "It's no surprise that young people are the fastest growing group of stamp collectors in the nation because children are natural collectors," said Dr. Patchen of The Children's Museum of Indianapolis. "To hold the first day of issue ceremony for the Insects and Spiders stamps here allows the museum an extraordinary opportunity to encourage collecting and learning." The Children's Museum of Indianapolis is a non-profit institution committed to enriching the lives of children and is the largest children's museum in the world today. The museum presents thousands of programs and activities each year and houses 10 major galleries that explore the physical and natural sciences, history, foreign cultures and the arts. More than three million school children are expected to participate in National Stamp Collecting Month this year. Fueled by growing interest in popular stamp issues like Daffy Duck, Xtreme Sports, Arctic Animals and Sonoran Desert, the 8-12 age group has become the largest participating group in National Stamp Collecting Month and one of the fastest growing segments of stamp collectors in the U.S.
To raise awareness of National Stamp Collecting Month and to encourage the use of stamp collecting as an educational tool, the Postal Service distributed more than 134,000 educational kits to teachers, postmasters and community leaders. The kits provide information and handouts on how to get started collecting stamps and the tools needed to start a collection. In October 1996, the Postal Service launched Stampers, a youth program designed to introduce a new generation of young people to stamps and stamp collecting. To date, more than 2 million kids have participated in Stampers free of charge by calling 1 888 STAMP FUN (1-888-782-6738). Members receive free mailings that include newsletters, posters, tips on how to collect stamps, and information on tools such as StamperSaver Cards that help make stamp collecting fun and easy. Stampers is a registered mark and StamperSaverCards is a trademark of the U.S. Postal Service.